For those who are trying to control what they eat but are forced to give in to that 4pm hunger, life is tough. Office canteens don’t serve anything that doesn’t have greasy and fried written all over it. Get out on the streets and you’re tempted by masala dosa, sandwich and vada pav. In short, diet aur weight loss ki band baj jati hai. The alternative could be carrying your own homemade healthy snack but honestly, who goes through that much trouble unless pregnant or seriously unwell. Around 7-8 years ago when I was new in Bombay and stayed alone, cooking wasn’t my favourite chore especially cooking for just myself. My dinner used to be a masala dosa from Anna ka thela or a simple dal chawal. There was a time when I tried the ready-to-eat meals from a brand called Parampara which made instant curries, dal etc. I think it’s still available in the market. Parampara made decent easy-to-cook meals but the thick creamy curries were in no way close to home-cooked food. Since then I sort of stayed away from pre-cooked food depending mostly on my own cooking. A couple of months ago I had tried the Knorr easy-to-cook meals and they would’ve been a disaster if I hadn’t added my own ingredients to better the dishes. 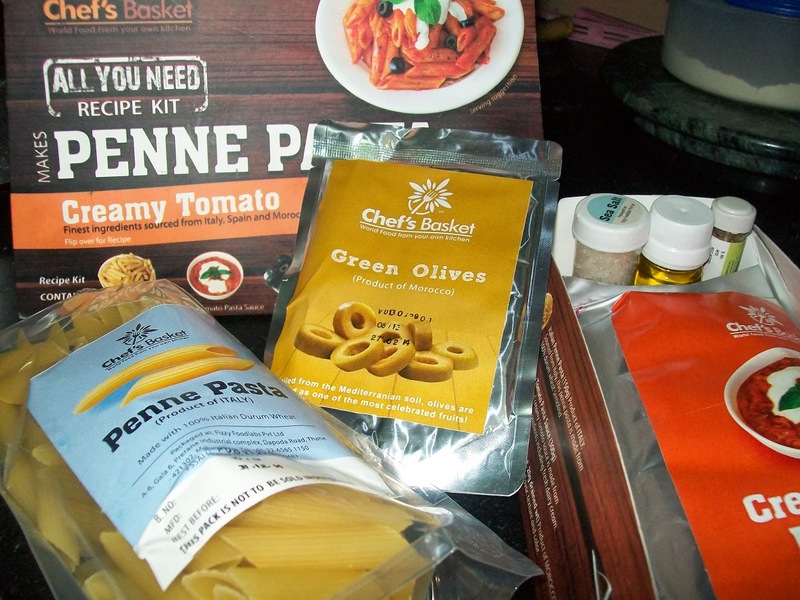 And recently I tried the All You Need Recipe Kit by Chef’s Basket. The product is launched by four IIT Alumni under their company Fizzy Foodlabs. 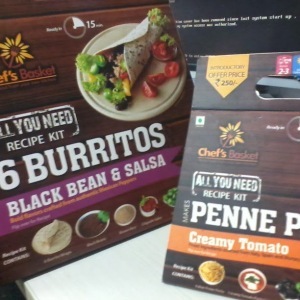 Apart from the packaging (they pack the food in easy-to-carry triangular boxes) what’s interesting about the Chef’s Basket is that all the ingredients are packed separately allowing you to add the ingredients according to your your taste.Right now they have three dishes; a Mexican burrito kit (Rs 350) , penne pasta in creamy tomato sauce (Rs 250) and penne pasta in Arabbiata (Rs 250). I tried the burritos and penne pasta in creamy tomato. 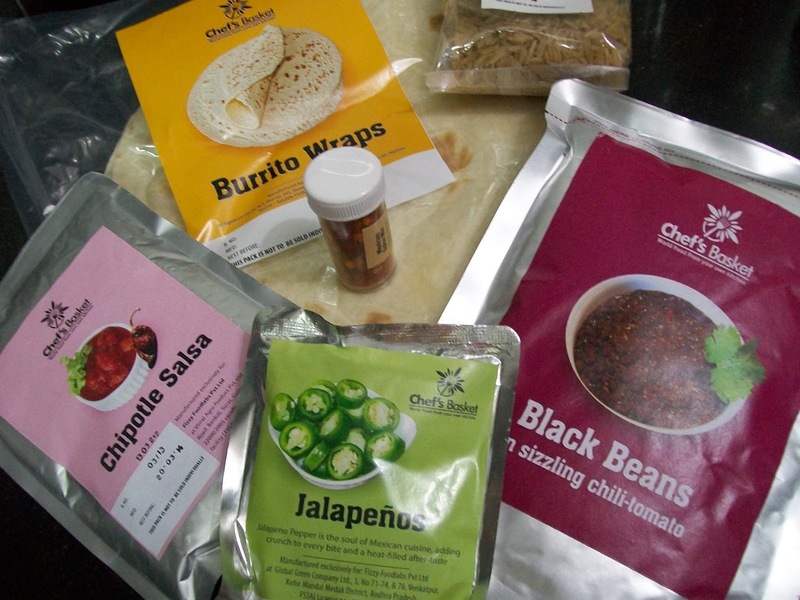 The burrito pack comes with six burrito wraps, brown rice, black beans, Chipotle salsa, jalapenos, Mexican spice mix and a soon to be launched Mexican salsa. I found the burritos just about average and a bit bland. 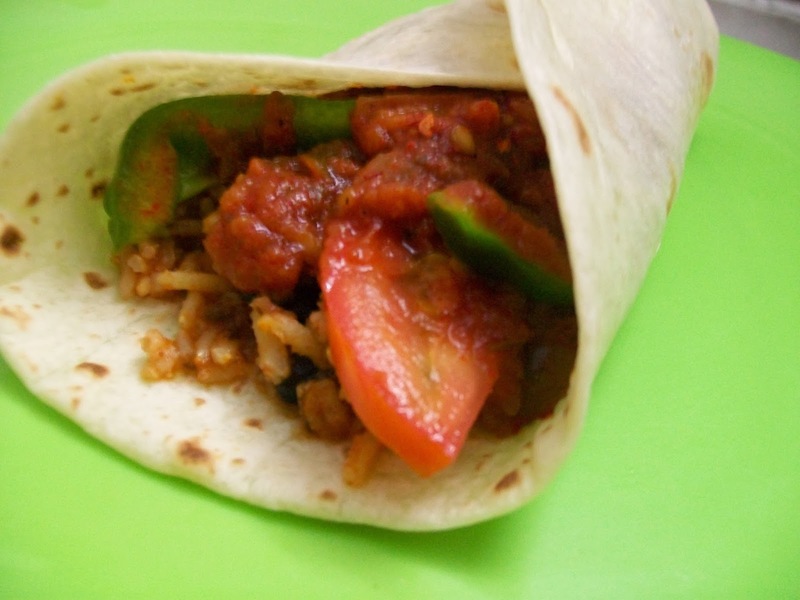 If you are trying this recipe I’d suggest you do away with the brown rice and throw in loads of lettuce and vegetables to add a bit of crunch. The sauces are spicy so be cautious while pouring them on your burrito. 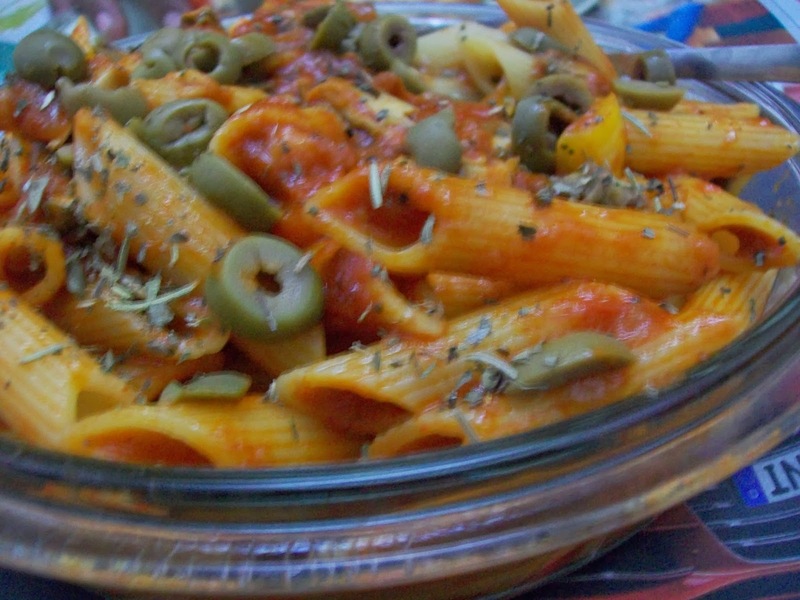 The penne pasta with creamy tomato sauce which comes with penne pasta, tomato sauce, green olives, mixed herbs, extra virgin olive oil and sea salt is recommended and enough for two people. The sauce is thick, creamy and tastes very close to the home-made one. You can add chicken, bacon or mushrooms to make the pasta richer. The Chef’s Basket recipe kits are perfect for those who don’t fancy cooking everyday or want a quick fix dinner on weekdays.